Anyone interested in a cool camping weekend in a delightful spot? I plan to go to the Casper Rally on 23/24 June. See the link below for details. I know its tough Dai but someone has to ride through scenery like that far from the busy hordes. Mate there's still time to get here and I can pick you up from the airport. Unlike us, you northern hemisphere lot probably wouldn't even think it was cold - probably in the very low single figures. I'll try to remember to get some photos this year. There are over 20 photos of the camping area uploaded by various travellers (ignore their mug shots) to Google. Have a squiz at the link below. Click through them on the right hand panel. It was a good fire, I'm in. Been to the Casper a few times. That site is a cold one, on par with the Alpine. Bollards can make access difficult to the grass with panniers on. Sidecars have to park up on the road and carry stuff down to the site. SCUM(South Coast United Motorcycle Tourers) are a good rally crew, been doing it for years. I actually went to the Black Duck Rally in WA '97 with a couple of SCUM. Great ride down from Oberon too. It's a definite possible maybe only 2 hrs and a bit from home. Gaz had the coolest k bike at the Casper this year Tom had the coolest F series and I had the coolest tent. Having trouble with photos and phone so I will upload a photo tonight. It was still -2c at 9 am. What... even cooler than Tom's Tent Mahal?? I would have taken more photos but I had to remove gloves to make phone camera work. 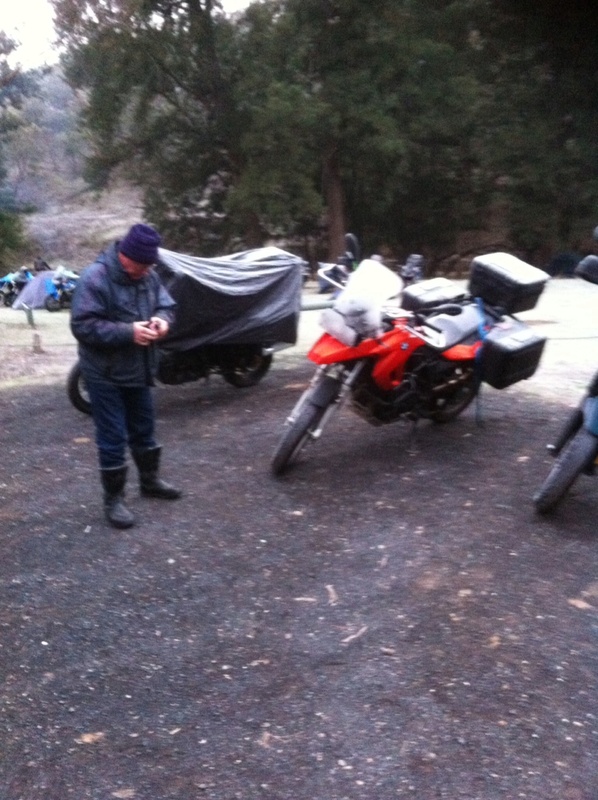 Not sure how cold it did get but my -5 sleeping bag was performing like an ash tray on a motorbike. Hi all! Well our hardy little band of Krew members has survived another Casper Rally and to go with the name it sure was white. Tom and I got away from Branxton at 8:00am on a beautiful clear winters morning on Saturday. 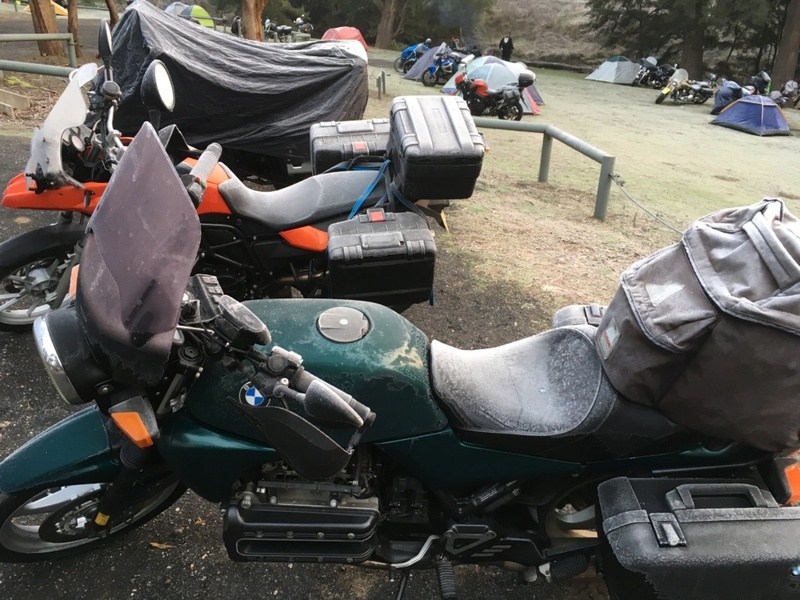 No frost but only a couple of degrees C but properly rugged up and with heated grips on high we looked forward to a great day. 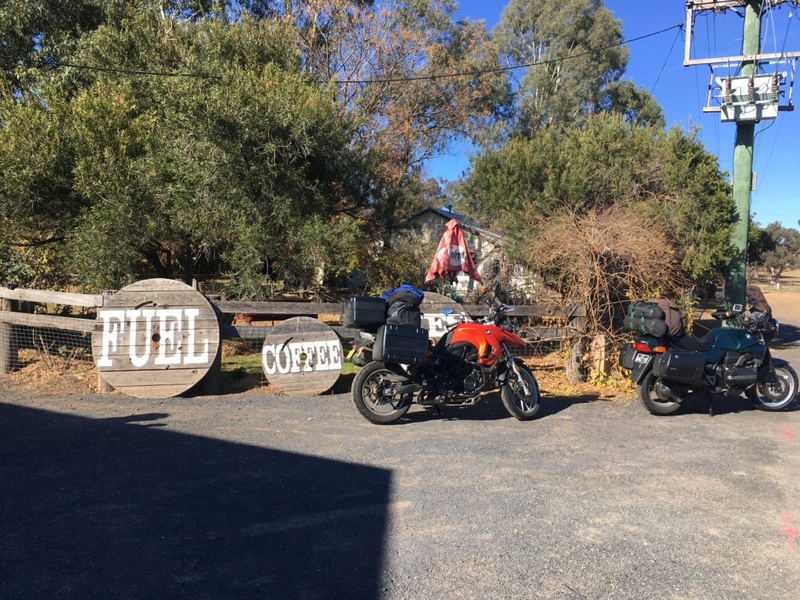 We called into the Bylong store and as the signs said fuel and coffee, we did, as Tom had around 200kms under his belt by then. 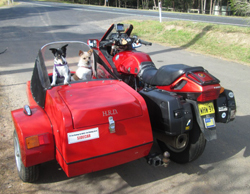 We powered on south via Capertee, South Bowenfels and Hampton into Oberon for lunch and fuel. This whole area had been blanketed with snow three days before and it had all gone but the air was still very crisp. Fed and fuelled we headed south to the rally site on the Abercrombie River, arriving about 2:45pm at the check-in tent, just under 500kms for the day for Tom and a bit less for me. As I pulled up I saw Waz walking away from the check-in heading towards the area of the camp ground where we camped last year. He had arrived shortly before us and was eyeing off the fire pit nearby that no-one had claimed yet. Handshakes all round and straight to the business of getting the tents up as quick as possible then grabbing a load of firewood and lighting up, thus claiming the fire. Others were welcome to join us but they had to bring wood to add to our stockpile for later. A good night was had with plenty of banter around the fire and I remember remarking at around 10:00pm that it didn't seem as cold as last year which quickly brought a reply from Waz that I should take a little walk into the bush as he had just done before jumping to conclusions. I did that shortly after as the mugs of port that I was consuming took effect and bloody hell! there really was a lot of heat coming off that fire. The inevitability of climbing into a cold tent came around and I managed to sleep for 3 hours before waking up thinking "I'm kind of warm enough but not quite enough to be really comfortable", so I pulled on the extra sleeping bag I had brought for insurance and drifted off to the sounds of some rallyists having a shouting match further down the campground - no doubt fortified from the cold by significant quantities of alcohol (as you do). When I dragged myself out of my tent, greeted by the white landscape, my fellow travellers already had the fire raging so breakfast was had and I wandered over to the bikes to take a morning photo. I managed to get this before the iPhone shut down. "Use iOS devices where the ambient temperature is between 0º and 35º C (32º to 95º F). Low- or high-temperature conditions might cause the device to change its behavior to regulate its temperature. Using an iOS device in very cold conditions outside of its operating range might temporarily shorten battery life and could cause the device to turn off. Battery life will return to normal when you bring the device back to higher ambient temperatures." It's true folks, I took the photo and blank screen, Apple Logo and off. Maybe I do still need a digital camera after all. It was after 10:00am and still very cold when Tom and I headed for home. Observed some snow still on the ground under the trees at Shooter's Hill as we wound our way through some roads less travelled up into the Blue Mountains, across the Bells Line of Road, down the eastern side and over the Sackville and Wisemans vehicle ferries then towards home via Kulnura and the Yarramalong Valley. Tom & I parted ways at Alison with him heading home via Doyalson and me taking Jilliby Road and up to Freeman's Waterhole then Cessnock to home at North Rothbury. Thanks to Waz for making the trip and my patient travelling companion Tom who never complains when I lead him around some of the very minor roads in this great country. Great kompany. Around 865 kms for me. its trips like these , you need to carry a blow torch to pre heat the bike before heading home . 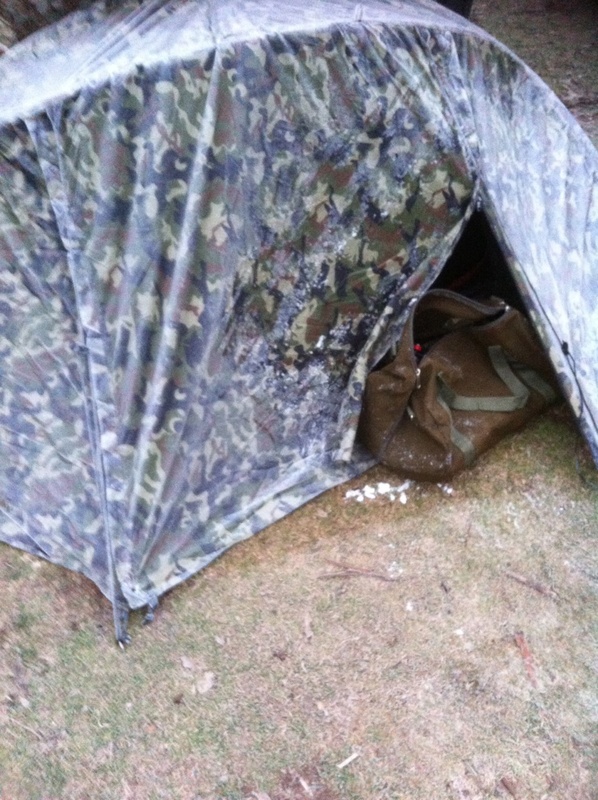 See if you can spot the K .
Gaz, how did the new sleeping bag liner perform? 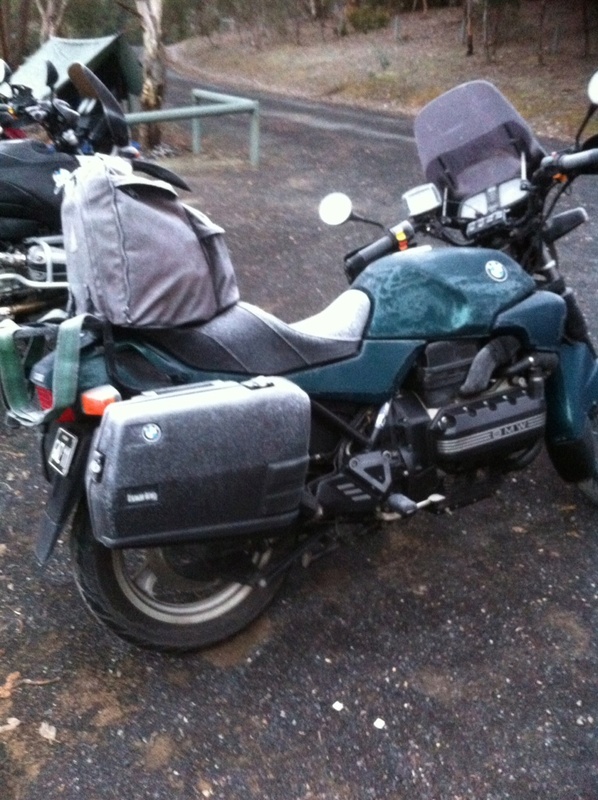 Also, is the green bike your K1100LT gone a bit naked or is it another bike? Seanii, the sleeping bag liner definitely improved the rating of the bag (which was 0 degC when I bought it many years ago). If my feet hadn't got cold I might have made it through without going for the second sleeping bag. A few other people spoke about cold feet interrupting their rest in those conditions. The liner manufacturer's claim was carefully worded as "can improve your bag rating by up to 15degC". The up to being the key. Not unhappy that I bought it. Yes that is my K1100LT nakedised a lot. I like it but may fiddle some more. I had thought I might change back to full fairing for winter but I like it being less bulky as it is and I have a set of bars on that give me slightly more leaning forward than the LT bars and I'm happy with that. I won't be going back to the full LT set up.